Above: Tarek Atrissi as a keynote speaker at the opening of the Nuqat conference in Kuwait in 2012. For the past 15 years, and as part of a commitment to support design education and literacy for both the design community and society at large, Tarek Atrissi has been a frequent guest speaker and lecturer in several international design conferences, events, and universities across the world. He gave public lectures about design in more than 20 countries: This included the SED conference in Las Vegas; The Icograda conference in Istanbul in Turkey; Reading University in the UK; The Tasmeem conference in Qatar; The V&A museum in London; The Amman Design institute in Jordan; The Type Directors Club in New York; The WREGA design conference in Kuala Lumpur in Malaysia; among many other venues. Tarek Atrissi gives regularly short workshops and courses, often typographically driven. He has also conducted in-house design training sessions and workshops upon demand for specific companies and organisations. 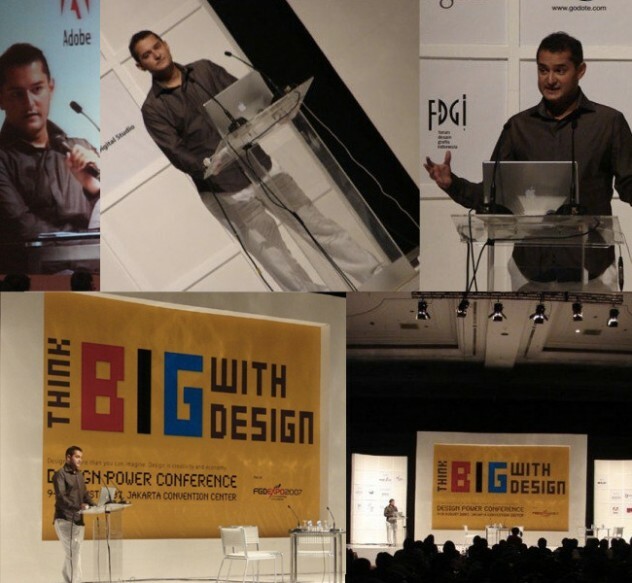 Above: Tarek Atrissi as a guest speaker in Jakarta, Indonesia, at the Design Power Conference, FGD Expo 2007. A full list of lectures, workshops and design events by Tarek Atrissi is listed below on this page. Various photos of such events are shown on this page. 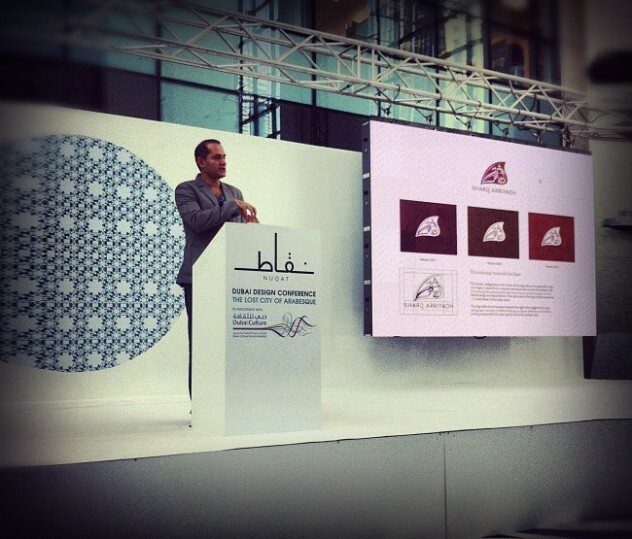 Above: Tarek Atrissi giving a lecture in Dubai, The United Arab Emirates, in 2012 as part of the design conference “the lost city of Arabesque”. 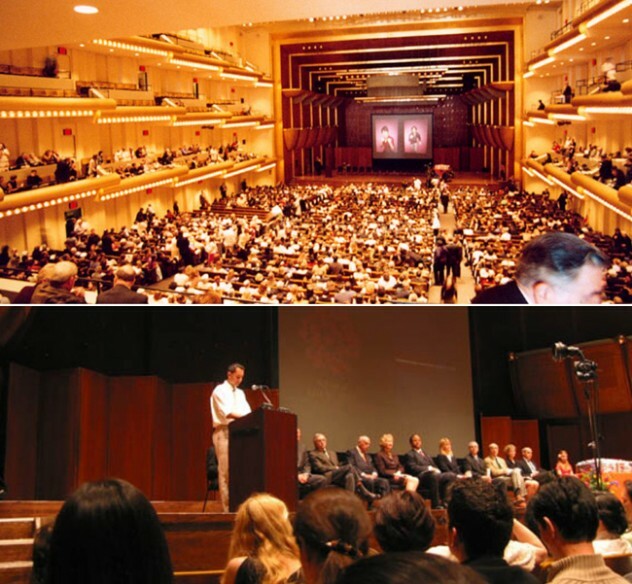 Above: Tarek Atrissi as a valedictorian speaker at the School of Visual Art’s 2003 graduation ceremony at the Lincoln Centre in New York. – Pune Design Festival, Pune, India. Public lecture. February 2018. – Saudi design week, Riyadh, Saudi Arabia. Public lecture + Arabic lettering workshop. October 2017. – Design Institute Amman, Jordan. Public lecture + Arabic type design workshop in collaboration with design institute Amman. October 2017. – Arabic Type Festival, Amsterdam, The Netherlands. Public lecture. September 2017. – Barcelona Design Week, Barcelona, Spain. Across borders exhibition. Talk during exhibition opening. June 2017. – Embassy of the Kingdom of the Netherlands in Algiers, Lecture & Workshop at the Bibliothèque Nationale d’Algérie in Algeria on Arabic lettering. April 2016. – The Design Alliance Asia Talk, Bangkok, Thailand. Lecture. October 2015. – Zayed University, Dubai & Abu Dhabi, United Arab Emirates. Lecture and Workshop series. September 2015. – Design Institute Amman, Workshop: Branding – “From Brief to Visual Identity Design”, Amman, Jordan. June 2015. – Zain Telecom, Internal/ Corporate Workshop: Understanding branding, Amman, Jordan. June 2015. – Saudi Design Week, Guest speaker, Riyadh, Saudi Arabia. May 2015. – Introduction to Arabic Type Design, workshop, privately organized, Riyadh, Saudi Arabia. May 2015. – Dubai International Arabic Calligraphy Exhibition 2015, Lecture: Typographic Landscape in the Arab World Today, Dubai, UAE. April 2015. – Dubai International Arabic Calligraphy Exhibition 2015, Arabic Typography Workshop: Lettering + Bilingual logo design adaptation. Dubai, UAE. April 2015. – Studio BAR event: 1001 Glyphs, Amsterdam, The Netherlands: An evening on the theme of Digitizing Arabic Typography. December 2014. – Nuqat Design Conference, Kuwait. Design workshop: Celebrating the beauty of Arabic language through creative design and expression. Workshop conducted with Suzanne Talhouk. November 2014. – Design Institute Amman, Jordan. Design workshop: Arabic Typography in the context of Branding. June 2014. – Nuqat Design conference, Kuwait City, Kuwait. November 2013. Arabic Urban Typography Workshop. – Iranian Graphic Design Society, Tehran, Iran. October 2013. Public Lecture and Lettering design workshop. – “Identity” design symposium, Dar Al Hekma College, Jeddah, Saudi Arabia. February 2013. – Hong Kong Design institute, workshop “Colors & Art Direction. October 2012. – BIFEX- Beirut International Franchising Forum and Exhibition, Beirut, Lebanon, Lecture 23-24 May 2012. – Next Future Observatory, The Calouste Gulbenkian Foundation, Lissabon, Portugal. Lecture, 12 May 2012. – HSDA Annual Design Symposium at Dar Al-Hekma College, Jeddah, Saudi Arabia. 7-11 April 2012. – Academie Beeldende Kunsten Maastricht, The Netherlands. Public Lecture and Workshop. 3 April 2012. – Nuqat Conference, Dubai, United Arab Emirates. Guest Speaker and Workshop. 17-21 March 2012. – TDC: Type Directors Club, New York, USA. Guest Speaker, 15 March 2012. – Dar Al-Hekma School of Design and Architecture Design Symposium, Jeddah, Saudi Arabia. April 17-20 2011. Lecture and Workshop. – Al Bayyan Newspaper, Dubai, United Arab Emirates. Design and information graphics Seminar & Workshop. 23-24 November 2010. – Day of typography, Basel, Switzerland. October 30 2010. Lecture. – Nuqat Design conference, Kuwait City, Kuwait. October 24-28, 2010. Lecture and Workshop. – Münchner Typotag, Munich, Germany. October 14, 15, 16, 2010. Lecture. – School of Visual Arts Masters Workshop- Venice, Italy. Guest critic. June 4-6 2010. – World Islamic Economic Forum, Kuala Lumpur, Malaysia. Lecture. 18 May 2010. – Abu Dhabi Higher Colleges of Technology, Abu Dhabi, United Arab Emirates. Lecture and workshop: 7-14 April 2010. – School of Visual Arts, New York, USA. MFA Design department. Lecture: 1 March 2010. – WREGA Design Power Asia conference, Kuala Lumpur, Malaysia. Lecture and workshop: 8-9 August 2009. – The Design Alliance Asia Talk, Kuala Lumpur, Malaysia. Lecture: 10 August 2009. – Graphic Design week, Dar El Hekma College, Jeddah, Saudi Arabia. Guest speaker and workshop leader. May 16, 17, 18, 2009. – Nuqat ‘ala Alhuroof conference, Kuwait city, Kuwait. Lecture & Workshop leader. May 13, 14, 2009. – Abu Dhabi Higher Colleges of Technology, Abu Dhabi, United Arab Emirates. Lecture and workshop: 25 April- 1 May 2009. – Utrecht School of the Arts, Faculty of Art Media and technology, The Netherlands. Guest Speaker. February 3, 2009. – Lebanese University, Fine Art / Graphic Design Department. Beirut, Lebanon. Guest Speaker. January 29, 2009. – School of Visual Arts – MFA Design program – New York, USA. Guest Speaker. October 17, 2008. – Parsons- The New School for Design- New York, USA. Guest Speaker. October 16, 2008. – Willem de Koning Academie, Rotterdam, The Netherlands. Guest Speaker. October 13, 2008. – Dubai Higher Colleges of Technology, Dubai, United Arab Emirates. Lecture & workshop: 25-26 May 2008. – Abu Dhabi Higher Colleges of Technology, Abu Dhabi, United Arab Emirates. Lecture & workshop: 27 May- 2 June 2008. – The Designer’s Freedom of Speech. Debate & Workshop. Bibliotheek Universiteit van Amsterdam, Bijzondere Collecties. The Netherlands- 23 may, 2008. – San Francisco Art Institute; Design and Technology Salon. Live Broadcast Guest Speaker. San Francisco, USA. April 10 2008. – One Day Typography. University of Southern Switzerland. Switzerland – 17 November 2007. – “Dutch Design?” Cosmo Design!”. Guest speaker at TENT. Rotterdam Center for Visual Arts. 20 September 2007. – Utrecht School of the Arts, ” Ondernemen voor Designers”. Utrecht, The Netherlands, 23 August 2007. – Design Power Conference, FGD Expo 2007. Jakarta, Indonesia. 8-12 August 2007. – Zayed University, Abu Dhabi, United Arab Emirates. Lecture: 21 May 2007. – Higher Colleges of Technology, Abu Dhabi, United Arab Emirates. Lecture & workshop: 20 May 2007. – Utrecht School of the Arts, Faculty of Art Media & Technology.-The Netherlands. Lecture: 12 April 2007. – Design + Strategy conference, Hanoi, Vietnam. Guest Speaker. 4-8 October 2006. – Kitabat Conference, American University in Dubai, 5-8 April 2006. Guest Speaker. – American University of Sharjah, UAE. Public lecture, 14 March 2006. – Utrecht School of the Arts, The Netherlands. Guest Speaker, 2005. – Notre Dame University, Zouk Mosbeh, Lebanon, 2005. Workshop & public lecture. – Ecole Superieure de l’art et de l’image. Brussels, Belgium. Guest Speaker 2005. – Magdalena Festival, Maribor, Slovenia. Guest Speaker + Jury member in the Magdalena awards, 2004. – Virginia Commonwealth University in Qatar. One semester course in Arabic typography. 2004. – Tasmeem Design Conference, Doha, Qatar. Guest Speaker, 2004. – American University of Sharjah, UAE. Guest Speaker, 2004. – Danish Cultural Center, Copenhagen, Denmark. Guest Speaker, 2004. – Danish School of Design, Copenhagen, Denmark. Guest Speaker, 2004. – TDC opening show, Munich, Germany. Guest Speaker, 2004. – School of Visual Arts, New York. Guest Speaker, 2004. – American University of Beirut, Lebanon. 2004, Guest Speaker. – Art Academy in Maastricht, The Netherlands, Guest Speaker, 2004. – Forum Typografie, Hannover, Germany. Guest Speaker, 2004. – UNESCO Regional Expert Meeting for Digital Creation: Guest participant in the Digital Arts UNESCO project, 2003. – Valedictorian, Graduation ceremony, School of Visual Arts, Lincoln Centre, New York. – School of Visual Arts, New York. Teaching assistant for Paula Scher’s course, Visual language. 2003. – Lebanese American University in Beirut. Guest speaker, 2002. – C&E American University, Beirut Lebanon. Guest speaker 2002.